Anthem: " Lijepa naša domovino"
1Locally also Italian in Istria county. Croatia ( Croatian: Hrvatska listen ), officially the Republic of Croatia (Republika Hrvatska), is a country in Europe at the crossroads of the Mediterranean, Central Europe and the Balkans. Its capital is Zagreb. 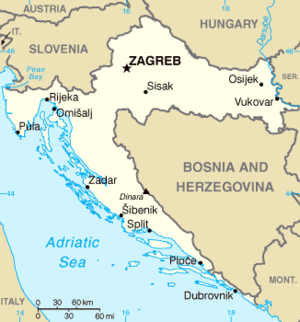 Croatia shares land borders with Slovenia and Hungary to the north, Serbia to the east, Bosnia and Herzegovina and Montenegro to the south, as well as a sea border with Italy to the west. It is a candidate for membership in the European Union and NATO. A tribe of Croats came to the Roman provinces of Dalmatia and Pannonia in the 7th century and was ultimately assimilated into the larger native Illyro-Roman and recently arrived Slavic population which took the same name. Ruled by various Croatian rulers, these duchies were intermittently controlled by the Roman Empire at Constantinople and the Franks. Eventually Croatia became an independent kingdom in 925, when — by a decree of the Holy Catholic Church in Rome — King Tomislav was crowned first king of Croatia. Croatia retained its independence until 1102 when, after decades of inner struggles, the country entered a dynastic union with Kingdom of Hungary under the name Lands of the Crown of St. Stephen. Croatian statehood was preserved through a number of institutions, notably the Sabor which served as an assembly of Croatian nobles, and the ban or viceroy. Furthermore, the Croatian nobles retained their lands and titles. By the mid-1400s, the Hungarian kingdom was shaken by the Ottoman expansion as much of the mountainous country now known as Bosnia and Herzegovina fell to the Turks. At the same time, Dalmatia became mostly Venetian. Dubrovnik was a city-state that was, at first, Byzantine (Roman) and Venetian, but later, unlike other Dalmatian city-states, became independent as Republic of Dubrovnik, even though it was often under the suzerainty of neighbouring powers. The Battle of Mohács in 1526 led the Croatian Parliament to elect the Habsburgs to the throne of Croatia. Habsburg rule eventually thwarted Ottoman expansion, and by the 18th century, much of the Croatian territories that had previously been Ottoman passed to the Austrians. The odd crescent shape of the Croatian lands remained as a mark, more or less, of the frontier to the Ottoman advance into Europe. Further south, Istria, Dalmatia and Dubrovnik all eventually passed to the Habsburg Monarchy between 1797 and 1815. Following World War I, Croatia joined the State of Slovenes, Croats and Serbs. 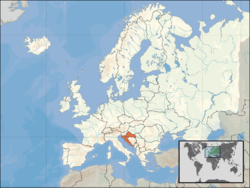 Shortly thereafter, this joint state entered into a union with Serbia to form the Kingdom of Serbs, Croats and Slovenes, which eventually became Kingdom of Yugoslavia in 1929. After Germany and its Axis allies invaded Yugoslavia in April 1941, the Nazis permitted the extreme right-wing organization Ustaše, backed and sponsored by Italian fascists, to found the " Independent State of Croatia". The new regime was highly dependent upon German support for survival. Numerous concentration camps were established in Croatia between 1941 and 1945, when many Serbs, Jews, Gypsies anti-fascist Croats and others were murdered for racial, religious or political reasons. When the Axis powers were defeated in Croatia by the anti-fascists, the State Anti-Fascist Council of People's Liberation of Croatia (ZAVNOH) declared the People's Republic of Croatia, which became one of the six socialist republics within federal Yugoslavia. Along with Slovenia, Croatia declared its independence from Yugoslavia on June 25, 1991, which triggered the Croatian War of Independence. The Serb population living in Croatia revolted, supported by the Yugoslav army and paramilitary extremist groups from Serbia. The ensuing months saw combat between newly established Croatian Army and joint Yugoslav/Serb armed forces. Following this stage of the war, the independence of Croatia was internationally-recognized. During the war, the Croatian Serbs proclaimed their own state in areas where they made up relative or absolute ethnic majority, the " Republic of Serbian Krajina", a short lived territory without international recognition. The war left hundreds of thousands refugees on the Croatian side, and thousands were killed either in battle or by ethnic cleansing. The war ended in 1995, after the Croatian Army successfully launched two major military operations to retake the occupied area. At the time of first modern Croatia's president Franjo Tuđman's death in December 1999, the country was in a parlous state. The HDZ lost power after the presidential and parliamentary elections at the beginning of 2000, which ushered in a new era of politicians who pledged commitment to political and economic reforms and Croatia's integration into the European mainstream. The left-centre coalition government was led by the SDP until November 2003, when the reformed HDZ formed minority government. President Stjepan Mesić, coming from centrist/liberal party HNS, was elected two times, in 2000 and 2005. The constitution has been changed to shift power away from the president to the parliament. Croatia has joined the World Trade Organization and opened up the economy, making it grow and inflation was kept under control. It joined NATO's Partnership for Peace program and became an official candidate for membership in that alliance. By early 2003 it had made sufficient progress to apply for European Union membership, becoming the second EU candidate country from former Yugoslavia, after Slovenia. Accession negotiations were opened on October 3, 2005, and the country is expected to become an EU member state in 2009 or 2010. Croatia is located in Southern Europe. Croatia has a shape that resembles a crescent or a horseshoe which helps account for its many neighbours: Slovenia, Hungary, Serbia, Bosnia and Herzegovina, Montenegro, and Italy across the Adriatic. Its mainland territory is split in two non-contiguous parts by the short coastline of Bosnia and Herzegovina around Neum. rocky coastlines on the Adriatic Sea ( Istria, Northern Seacoast and Dalmatia). 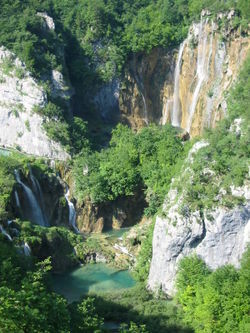 National Geographic Magazine in 2005 named Croatia as the most beautiful country in the world. Croatia offshore, has more than 1,000 islands varying in size. Since the adoption of the 1990 Constitution, Croatia has been a democratic republic. Between 1990 and 2000 it had a semi-presidential system, and since 2000 it has a parliamentary system. The President of the Republic (Predsjednik) is the head of state, directly elected to a five-year term and is limited by the Constitution to a maximum of two terms. In addition to being the commander in chief of the armed forces, the president has the procedural duty of appointing the Prime minister with the consent of the Parliament, and has some influence on foreign policy. The Croatian Parliament (Sabor) is a unicameral legislative body of between 100 and 160 representatives, all elected by popular vote to serve four-year terms. The plenary sessions of the Sabor take place from January 15 to July 15, and from September 15 to December 15. Croatia has an economy based mostly on various services and some, mostly light, industry. Tourism is a notable source of income during the summer. The estimated Gross Domestic Product per capita in purchasing power parity terms for 2005 was USD 12,158 or 45.2% of the EU average for the same year. The Croatian economy is post-communist. In the late 1980s, at the beginning of the process of economic transition, its position was favourable, but it was gravely impacted by de-industrialization and war damages as well as having problems from losing the markets of Yugoslavia and the SEV. Main economic problems include high unemployment (15.7% in 2006) and an insufficient amount of economic reforms. Of particular concern is the heavily backlogged judiciary system, combined with inefficient public administration, especially involving land ownership. In February 2005, Croatia implemented the Stabilization and Association Agreement with the EU and is advancing further towards full EU membership. The country expects some major economic impulses and high growth rates in the following next years (currently Croatia suffers from high export deficit and considerable debt). 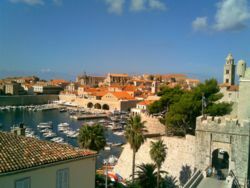 Croatia is expecting a boom in investments, especially greenfield investments. The population of Croatia has been stagnating over the last decade. The 1991–1995 war in Croatia had previously displaced large parts of the population and increased emigration. Some Croats who fled the country during the war are returning. The natural growth rate is minute or negative (less than ± 1%), as the demographic transition has been completed half a century ago. Average life expectancy is approximately 75 years, and the literacy rate is 98.5%. Croatia is inhabited mostly by Croats (89.9%). There are around twenty minorities, Serbs being the largest one (4.5%) and others having less than 0.5% each. The predominant religion is Catholicism (87.8%), with some Orthodox (4.4%) and Sunni Muslim (1.3%) minorities. The official and common language, Croatian, is a South Slavic language, using the Latin alphabet. Less than 5% of the population cites other languages as their mother tongues. Croatian culture is based on a thirteen-century-long history during which the country has attained many monuments and cities, which gave birth to a good number of brilliant individuals. The country includes six World Heritage sites and eight national parks. Two Nobel prize winners came from Croatia, as did numerous important inventors and other notable people — notably, some of the first fountain pens came from Croatia. Croatia also has a place in the history of clothing as the origin of the necktie (cravat). The country has a long artistic, literary and musical tradition. Of particular interest is also the diverse cuisine.